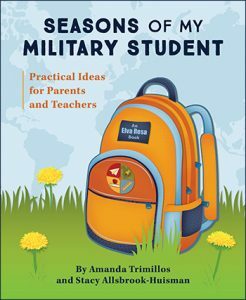 Students in military families change schools between six and nine times by the time they graduate from high school, according to the Department of Defense Education Activity (DoDEA.) Frequent moves and other military-life events, such as deployments, create additional challenges for these students. Amanda is a nationally board-certified teacher and a professional development designer in the NBC Teacher Leadership Department of National University, San Diego. She has served as a mentor for the US Department of Education’s “Teach to Lead” trainings, giving voice to teacher leaders throughout the US. Stacy is an Air Force spouse, writer, mother, and advocate for military spouses and families. As a trainer for the Military Child Education Coalition since 2017, Stacy is a Parent-to-Parent Educator, leading workshops and seminars on many topics related to the education of military-connected students. Stacy’s passion for military-connected students has led her to many volunteer positions, both stateside and with Department of Defense Education Activity schools overseas, and with multiple Parent Teacher Associations over the last decade. Stacy is a featured writer for Military Spouse magazine, where she covers parenting topics, and is a guest writer for several national blogs. Elva Resa Publishing is the leading US publisher of resources for and about the military family, and we are part of that family. At every level of production, from inspiration and creation to design and production, our materials are handled by publishing professionals with military life experience. We encourage individuals and organizations to share our SeasonsofMyMilitaryStudent.com articles. We provide the following guidelines to efficiently assist you. If you would like to share any articles on your website or social media site, please link to the article on SeasonsofMyMilitaryStudent.com (please do not republish entire articles on your site). To share articles in an electronic newsletter, please include in your newsletter the title of the article (alone or with no more than the first paragraph of the story) and a link to read the complete story on SeasonsofMyMilitaryStudent.com. >Please reprint the article in its entirety without modifications (please contact us if you need modifications). >If the online article includes individual bylines or photo credits, please include those in your reprinted article. We appreciate receiving a copy of printed publications in which reprints appear. Thank you for supporting military-connected students!